Mychelle has been a contributor to Pet Health Network since 2014. 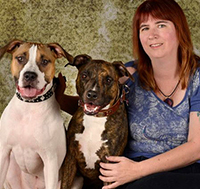 She is a Certified Dog Behavior Consultant through the International Association of Animal Behavior Consultants. She also served for many years as editor for both the IAABC and Association of Professional Dog Trainers’ journals, as well as working for several years for the APDT. Currently she serves as the Web News Content Editor for the United States Dog Agility Association. She has over 13 years’ experience working in animal sheltering both as a staff member and a volunteer, and is passionate about promoting training and behavioral health for dogs and cats to increase adoptions and reduce pet relinquishments. She also holds a Masters of Social Welfare from UCLA. Mychelle lives in Las Vegas, NV with her husband and three dogs, Kaylee, Jack and Odie. She can be reached at www.bheanmadra.com.